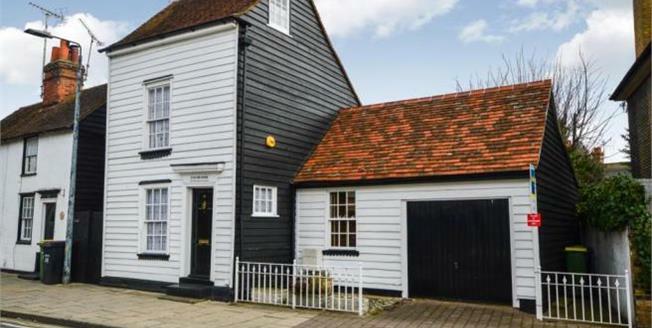 A stunning Grade II listed 17th century detached property, formerly the historic Rochford Fire Station which you really wont want to miss out on. The pretty weather boarded exterior opens to the beautiful interior oozing with character and original features, where you are welcomed with a period beamed reception area with a cosy fireplace and wood burner, before the accommodation extends over the first and second floors with two doubles. This fantastic home further offers a fitted kitchen/dining room, a four piece bathroom featuring a roll top bath, a garage, a pretty courtyard style rear garden and gas central heating. All of this come located in the centre of Rochford with the Town Square on the doorstep, a 10 minute walk of Rochford Station serving London Liverpool Street and within easy reach of Southend International Airport. Approximately 955 square feet. Fitted wall and base units and drawers, roll edge work surfaces, one and a half bowl sink and drainer with mixer tap, waist height electric oven, gas hob, overhead extractor, spaces for under counter fridge, freezer and washing machine, sash window facing the front, window facing the rear, part tiled walls, tiled flooring, wall mounted boiler, radiator, integral door to the garage. Units fitted to the rear of the garage. Wall lights, stairs leading to the second floor, access to the first floor accommodation. Sash window facing the front, beamed ceiling, built-in wardrobe, wall lights, radiator. Low level WC, roll top bath with claw feet and telephone style mixer tap, single enclosure shower, pedestal sink, tiled walls, window facing the side, engineered wood flooring, built-in storage cupboard, radiator. Window facing the side, beamed walls and ceiling, built-in wardrobe, wall lights, radiator. Courtyard style rear garden being paved and complemented with potted plants, gate leading to a shared sideway giving side access.